Dungarvin Kentucky’s services focus on enhancing independence and maximizing the quality of life of the individuals we support. All of our services are provided under the Supports for Community Living (SCL) and Michelle P Waivers (MP). Services under the SCL Waiver include Residential Level I, Level II and Level III. Residential Level I provides 24 hour care in a company owned or leased staffed residence. This home is in the community and can have up to a maximum of three residents. The ratio of staff to supported individual is 1:3. Residential Level II provides Adult Foster Care. This is a contract provider service. Up to three individuals can live and be supported in a contracted provider’s home. The provider contracts with Dungarvin Kentucky to provide these services in their home. Residential Level III provides up to 12 hours of service per day for an individual. Day Training services provide education, training and leisure services. These services are provided under both the SCL and MP waivers. These services provides 24 hour residential supports in a company owned or leased home called a Staffed Residence. This home can support up to three (3) participants with Intellectual and Developmental Disabilities. Homes can be modified in order to support the person properly. Disabilities range from Mild to Severe. This program is funded by the Medicaid Waiver, Supports for Community Living and provides total support and care for the participants living in the home. Some of these supports include, but are not limited to, daily care, medical support, mental health support, meal preparation and development, and community support. Residential Level II services are 24-hour Adult Foster Care supports. These supports are provided in the contracted providers’ homes. Dungarvin Kentucky contracts with providers to support up to three (3) participants with Intellectual and Developmental Disabilities in their home. Disabilities range from Mild to Severe. This program is funded by the Medicaid Waiver, Supports for Community Living and program provides total support and care for the participants living in the providers’ home. Some of these services include, but are not limited to, daily care, medical support, mental health support, meal preparation and development, and community support. 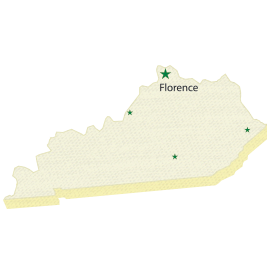 Kentucky’s Day Training Services are currently available in Florence, Pikeville and Somerset. They consist of education, training and leisure activities. The programs include providing assistance with community involvement in the form of outings and/or community programs coming into our facilities. All day training programs are funded by the Supports for Community Living or Michelle P. Medicaid Waivers. Services include, but are not limited to, activities for daily living training and supports, education and training on preferred topics, physical activities (e.g. exercise, games, etc. ), leisure activities (including art programs, games, crafts, etc. ), community activities, outings, outside activities, and community services coming into the facilities.